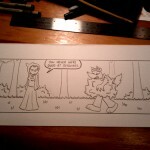 As all my loyal readers know, in my comic strip Goldilocks is the second most popular girl in school after Rapunzel. But when Goldilocks first appeared in Suburban Fairy Tales back in March 2009, she was actually supposed to be Alice from Alice in Wonderland. Crazy, huh? The only pro blem with the quick name change was that it was too late to change the artwork. 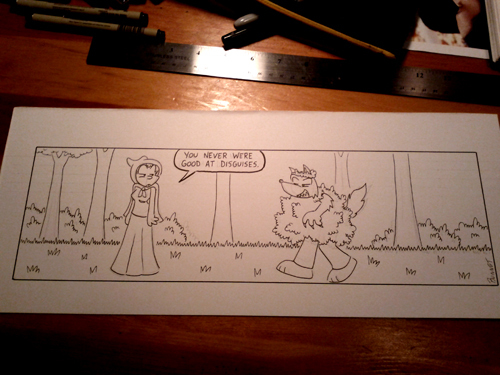 Suburban Fairy Tales’ Goldilocks didn’t really look anything like classic Goldilocks and that kind of annoyed me. So with each subsequent appearance I gradually gave her longer hair and “curled” it to give her the appearance of having “golden locks.” This second image of her was from her latest appearance in December 2011. I’m much happier with my new Goldilocks’ character design. So why does any of this matter? 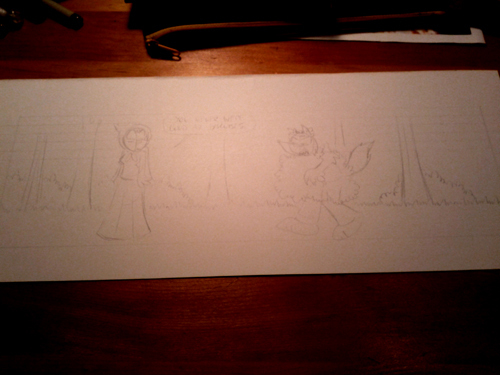 Well I wanted to use this as an example to show that I’m not above making corrections to my strip. Sometimes I look back at my work and think about how I should have done things differently. One good example of this is coming up in a future storyline. I don’t like my Prince Charming — I don’t like this personality or his character design. So I’m going to introduce another Prince Charming. Oh, don’t worry, there will be an explanation… but I don’t plan on spoiling it here! 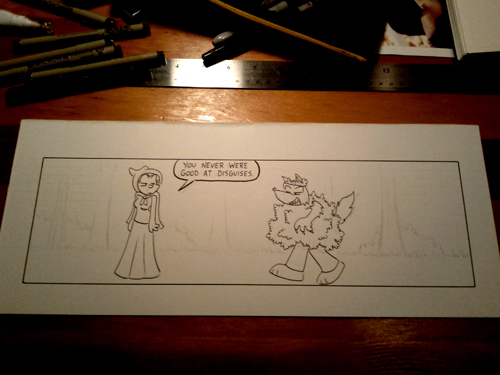 Drawing a comic strip is a thoughtful process. Most of the time I sit down for an hour or so and sketch a whole bunch of ideas into my sketchbook — whatever comes to mind, good or bad. Then the following day I’ll go back to my sketchbook and re-read my ideas. 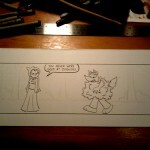 Sometimes the ideas are really great and they go right into the comic strip. Other times the ideas are so-so, but have potential, so I attempt to re-write them to make them better. Other times the ideas are simply awful and I put a big X through them. Sitting down to write these ideas is a pretty straightforward process, but sometimes an idea comes to me out of the blue. That’s when I have scramble to write it down somewhere because I know that in two minutes I’ll be distracted by something else and forget the idea entirely. One example of an idea popping up is when I was sitting at my booth at NY Comic Con. 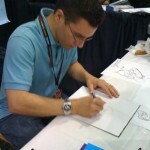 I was drawing sketches for fans who purchased a copy of my book. 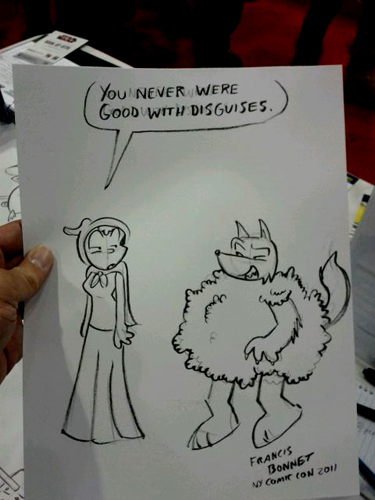 Most of the sketches were characters in simple poses, but one sketch featuring Red Riding Hood spawned an idea that I thought would be great for the actual comic strip. So I made sure to snap a picture of that sketch before I gave it away so I could remember it for later use in Suburban Fairy Tales. 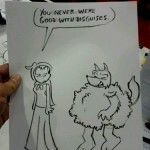 Below is the original sketch idea from NY Comic Con. 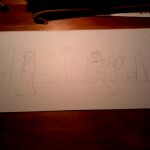 The other photos are each step I take in drawing a strip — from pencils to the final product. 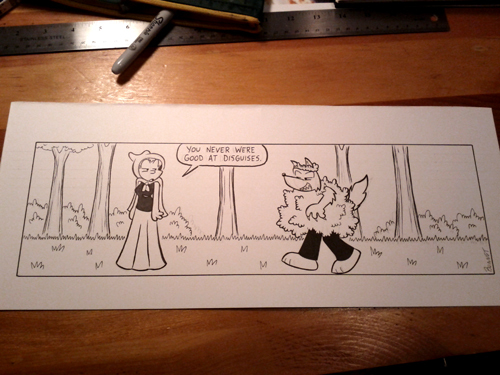 The final completed strip was posted on October 28, 2011. 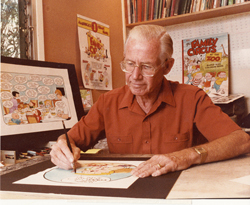 You may or may not have heard the sad news, but Bil Keane, creator of The Family Circus, passed away at the age of 89 on November 8. 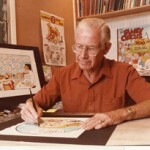 Love it or hate it, The Family Circus is one of the most famous and treasured newspaper comics of all time. Yes, I know many people consider The Family Circus to be corny, but the strip has had a major impact on the funny pages since its launch in 1960. 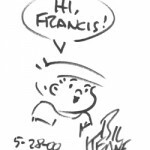 I had the pleasure of meeting Bil Keane back in 2000 at the Reuben Awards held at the World Trade Center in New York City. He was a very nice man and actually very funny in person. He was kind enough to draw me a quick sketch, which I would like to share below. 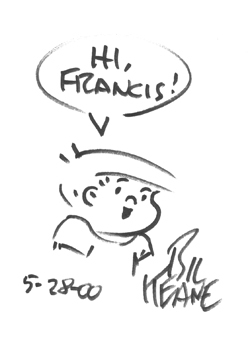 Bil Keane will most certainly be missed by many fans around the world. This Little Piggy Gets a Price Drop! 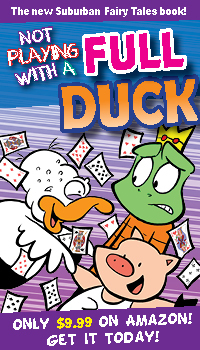 Fans at NY Comic Con really seemed to dig the price point of $10 for the newest Suburban Fairy Tales book, This Little Piggy Gets Even. The $10 price was quite a bargain considering the online price for the book has always been $13. Unfortunately there were some people who passed by the Suburban Fairy Tales booth at NY Comic Con and didn’t really discover the comic strip until they got home and read one of those little postcards we were handing out. So naturally they were bummed that they missed out on picking up the book for the cheaper convention price. Well I’m here to tell everyone not to worry, because effective immediately This Little Piggy Gets Even is now $9.95! This price drop is only on Amazon for now, but will soon hit other booksellers such as Barnes & Noble and Buy.com. 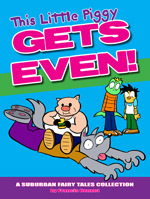 Click here to buy This Little Piggy Gets Even for $9.95 from Amazon now! NY Comic Con a Success! It was a long weekend — Thursday through Sunday, but I have to say that it was definitely a success. The place was packed! 105,000 people showed up to fill the halls of the Jacob Javitz Center in New York City and Suburban Fairy Tales had a great presence. 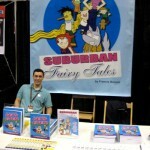 Suburban Fairy Tales was in the Small Press area, booth #2841. We were right next to Artists’ Alley, so we had a great location. It was so busy at times that you couldn’t even move! I was lucky enough to meet some current fans face to face and I also made a bunch of new ones. 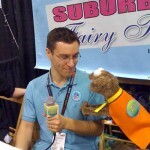 Oh, and I also got interviewed by a puppet. The newest Suburban Fairy Tales book, This Little Piggy Gets Even, was being sold at the booth and came with a free sketch. Let’s just say that I couldn’t draw the sketches fast enough! I want to thank all the fans who came to the booth and supported the comic strip. You guys really are the best! I’d also like to thank the people who helped me run the booth. There’s no way I could have done it without you! Special thanks to Alina, Stephanie, Pete, and my wife LeeAnne. And another thanks to Chris and Eric, who shared a small section of my booth in the beginning, until they happened to get a booth of their own.